1. 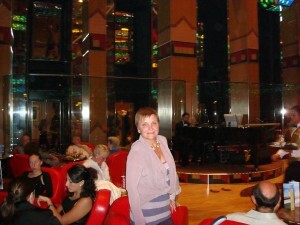 Lidia, recently you’ve been on cruise in Adriatic Sea with a stop in Venice. 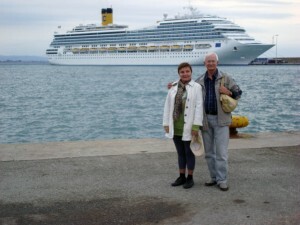 My family and I also were on Mediterranean cruise and visited Venice. What was the most remarkable impression from your point of view? 2. Island Lido, the major park and beach of Venice. Upon our getting on the island, the air struck our nostrils, overwhelmed by the fragrances of the South and fashionable resort of Italy. After humid Netherlands where we lived lately, it was entrancing. 1. Great. And what else was interesting on the Lido? 2. Lush vegetation and particularly everywhere you go, you hear Russian speech. It seems to me that Russians know how to select the best places where to stay in each country they go. 1. You’re right! We noticed the same in Barcelona and Valencia! What else did you remember? 2. Along the whole island beach boulevard there are lots of cedars with ripened nuts of huge sizes, which nobody picks up. Well equipped beach is populated with the small cottages where one can keep one’s own beach equipment, beach chairs and personal belongings etc., and this is all 20 minutes of sea tram ride from the Venetian Airport and 15 minutes from the centre. Many cafes, restaurants are here where delicious food is served. 1. Yes, the same was on the Lido deck on our cruise ship “Oosterdam”. 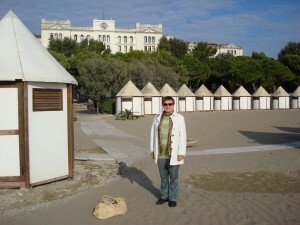 It was named even after this Venetian island Lido. Lida, here the Philippine cooks did their best to please us. That is why I started to love the Philippine omelets when they used to make them just in front of our eyes, fillings are of your own preference. One minute – everything is done – eat and enjoy a healthy and delicious dish! 2. Oh, it was a good time indeed. You sailed on Holland America Line, we on “Costa Fortuna”, and now after 4 years parting today we met each other like the two ships in the sea. On this special occasion, please, listen to the song “Dark Eyes”, so much loved by the Russians abroad.